Just Salad, an NYC-based chain of eco-friendly salad bars, is giving you a reason to get your smoothie on! 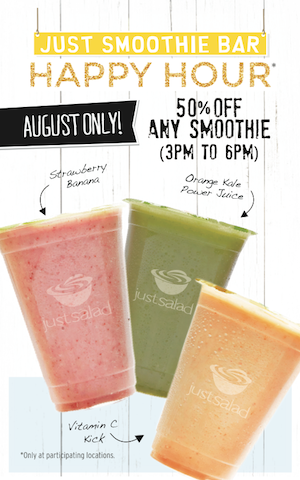 All month long, swing by one of their 13 locations from 3PM-6PM for their Just Smoothie Happy Hour. All smoothies and juices will be half priced including Strawberry Banana, Vitamin C Kick, Tropic Spinach Thunder, Peanut Butter Chia Warrior and Orange Kale Power Juice.